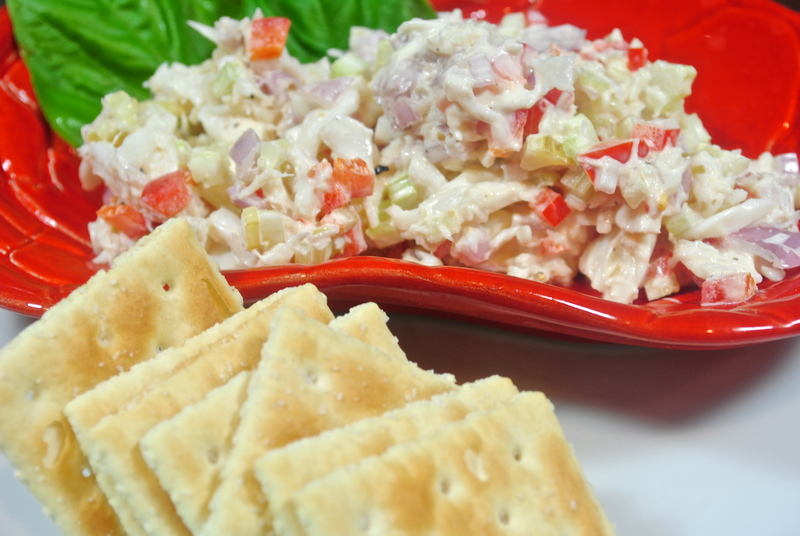 When I made crab cakes recently I decided to save some crab and the next day I made this delicious crab salad. What I did with the salad was make a cute little amuse bouche. Last year on several occasions I bought crab and was so disappointed with my finished recipe I did not think I would ever buy it again. I’m glad I did and I just love this little stuffed tomato. 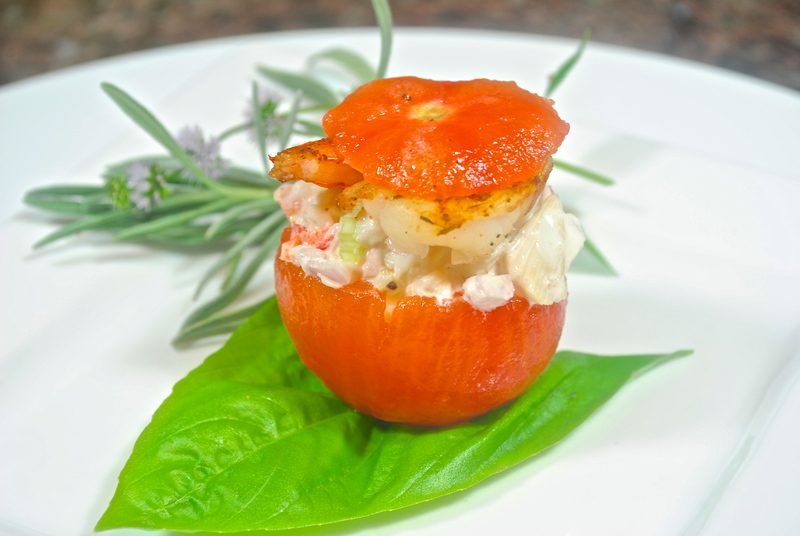 A while back I was looking at a catering magazine and saw a little stuffed tomato that someone made and it was stuffed with some type of risotto. There was no recipe so I had to come up with my own version of what to fill the tomato with. 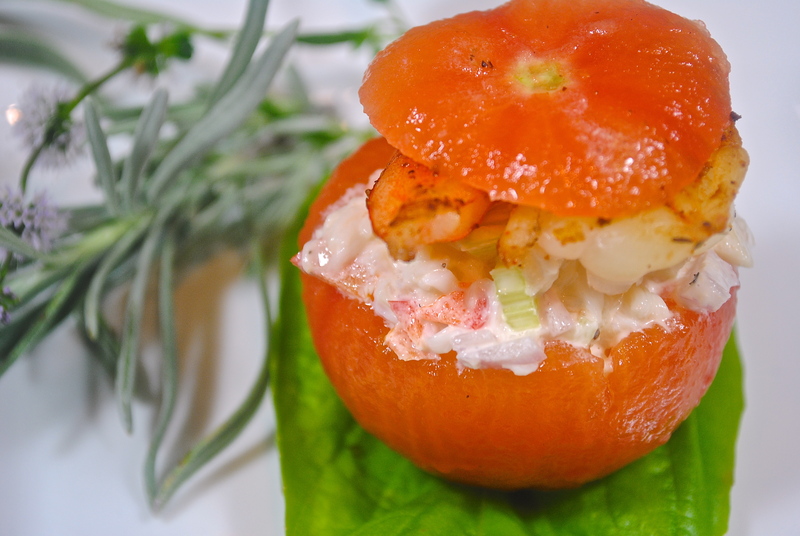 What I really like about the look of this appetizer is that the tomato is blanched and peeled. I used campari tomatoes, blanched for about 3-4 seconds and then plunged into ice water and then slipped the peeling off. The crab salad was a perfect light filling. This little blanched, peeled tomato would make the perfect vessel for any type of salad you may want to put in it, just put up something at the market for a filling and you have a gorgeous appetizer. This may have to be a knife and fork appetizer but would make a good first course to any meal if made bigger. I added a grilled shrimp to the top of each. 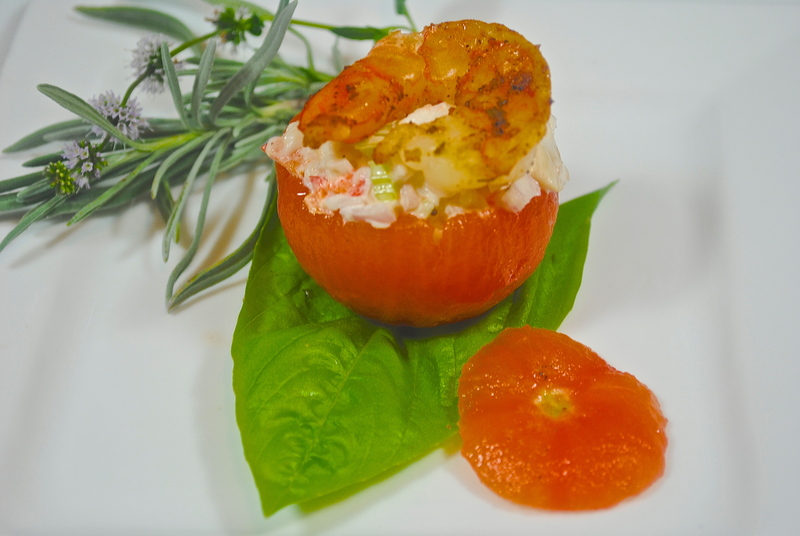 In fact, I cut the shrimp in half because it was too big for the tomato. 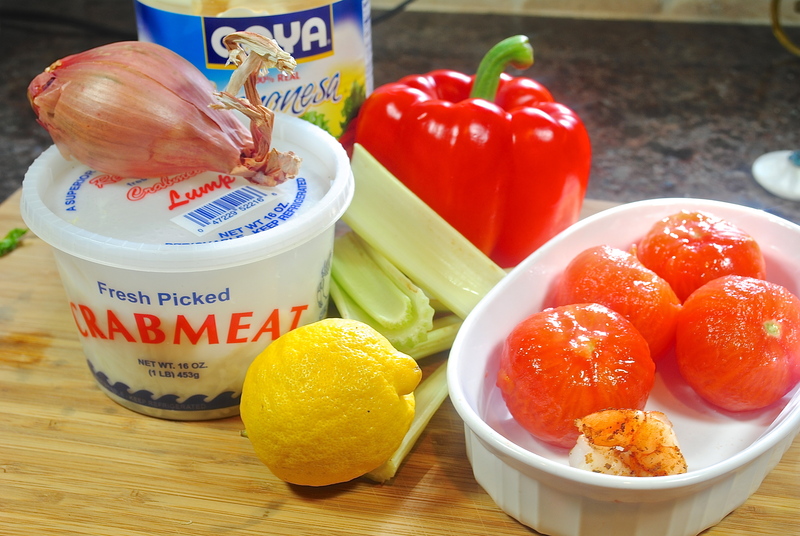 A few ingredients for a great starter. I used shallots this time; next time I may try green onions. Top the crab salad with a grilled shrimp; I used one cut in half. We also ate this with saltine crackers and I had some baguette slices that I lightly toasted. Gently pick through the crab meat and discard any pieces of shell. All all the other ingredients and stir just until combined. Serve with crackers or toasted baguette slices. Bring a pot of water to boil and drop in the tomatoes for about 3-4 seconds. Remove with slotted spoon and put in a bowl of ice water. Let sit for about 5 minutes and then remove and using a paring knife peel the skins off. You may want to cut a small slice off bottom so the tomatoes will not roll over. Slice off top of tomato and set aside. 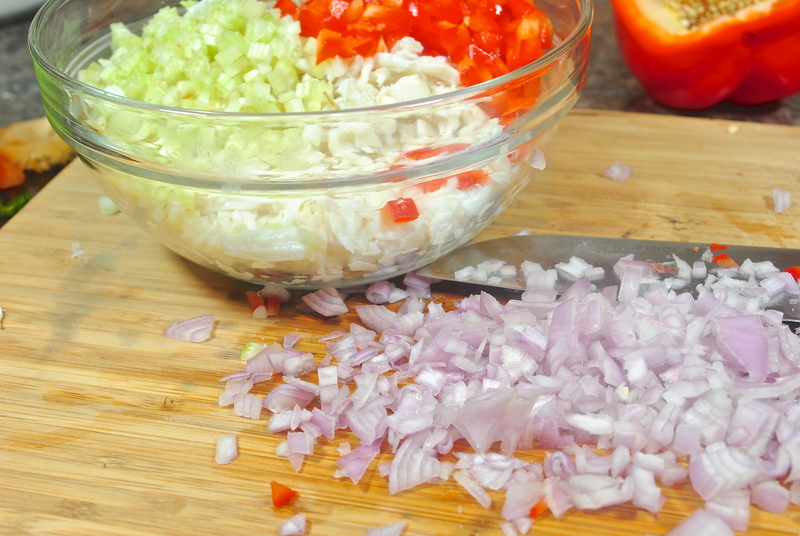 Using a small spoon or scoop, remove the tomato pulp from the inside of the tomato and discard. 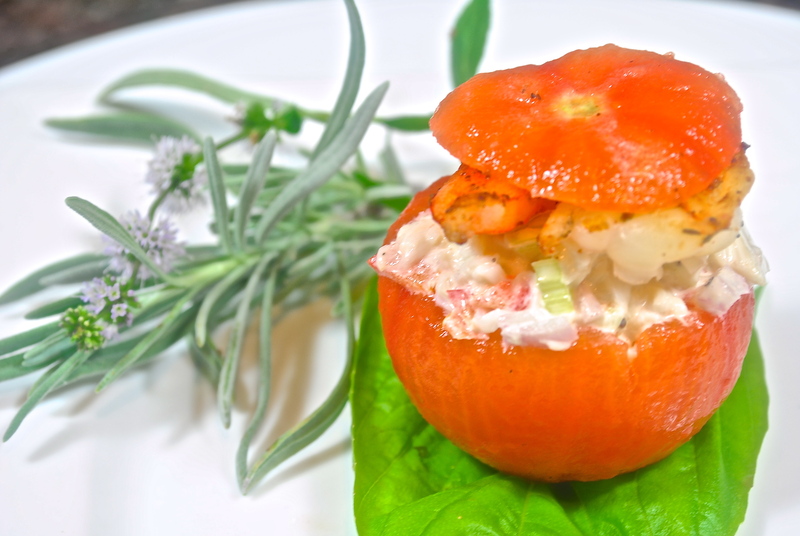 Fill each tomato with some of the crab salad then top with a piece of the shrimp and then put the top back on. Garnish with some additional herbs. If you want to do this as a first course appetizer, I would use a small regular tomato per person.